This warranty shall cover ALL installation completed after April 15, 2009. NyLawn hereby offers a Three (3) Year Limited Warranty on Residential and Commercial Installations to the End User. or incidental or consequential damages. 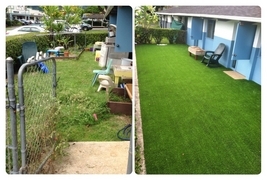 Our el toro premium turf looks even more beautiful than anticipated. Our friends and family had such glowing things to say about it...some even thought it was real grass! Hi Rory! Thank you so much for the beautiful job! I love my pool area again! Rory, Your guys were very professional in the work they did here at my house. It came out beautiful. I also really appreciate you getting it done before Sat. Just wanted to write and tell you how pleased we are with the turf. What a difference it makes. The yard is now inviting and the children will have a great time on it. Thanks also to the great crew you sent out. They were very efficient and were very pleasant to work with. We appreciate you having the crew fluff up the grass in the center playground. (previous installation) It looks almost brand new again. Thank you so much for providing us with such great service. Dear Rory, It wasn't long ago that I called NyLawn to ask for info about the product-- and you answered the phone. You were very informative, encouraged my interest and referred me to your associate Lia for more information. I'm gazing at the picture-perfect (and very realistic) backyard landscape that was recently installed by your competent and artistic staff Clito and Xandro. We couldn't be more pleased with this wonderful solution for my family and me! It's beautiful, but that's not all. With a severe grass allergy, I could never sit on the grass before, but now...I'm wrestling on it with my dog! When she jumps in and out of the pool, there are no muddy bogs to repair, and no mud and grass in the pool! The installation was a delight to observe, with Clito and Xandro working so efficiently together. Your staff is not only hugely competent and hardworking, but artistic in their application. There are little tufts of grass poking out from behind rocks! It looks so lifelike. They're helpful, considerate, clean and ultra professional. Lia was constantly checking on us and making sure we were prepared for the crew to arrive and then satisfied with everything. She was prompt in responding to phone calls and made your company feel warm, caring and kind. She has nothing but positive things to say about the people she worked with. and made us feel confident with our choice. So thank you very much for your excellent product and service. We will be highly recommending you to friends and neighbors! Appreciated the fast and professional service you did on our lawn. Will recommend your services to others. Thank you! Rory, it's been 2 years and we are still so happy with the lawn. Best home improvement I've had done so far. Thank-you! The installation went perfectly today. Your crew was very personable, able and enjoyable to have around. My former desert looks like an oasis.......Thanks!! Thank you for such a wonderful experience. Great group of people with super attitudes and work ethic!! We have seen lots of smiles these last two days from children, parents and staff. Looks great!! Hi Rory, It has been over a year since you installed your grass in my cat sanctuary and I thank you daily for the much improved quality of our lives with such an incredible product. The cats love to lie on it in the sun, as well as sleep out under the stars....they have abandoned their cozy little fake fur beds for the cool grass....and when it rains, I no longer dread the mud on their paws, and mine...and no more puddles, as it drains with such ease. We rake up the fallen leaves every couple of weeks and just hose it down once a month... It is home turf to 100 cats and it looks and feels just as good as it did that first day. Pretty amazing! I cannot thank you enough!